When you know that God likes you, you can start to really like yourself. When you start to like yourself, other people begin to like you too. Liking yourself doesn’t mean you’re full of pride; it simply means you accept yourself as the person God Created you to be. 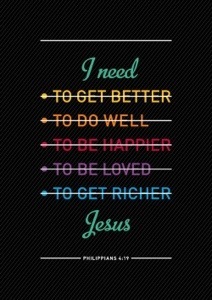 Aren’t you glad we serve a God who promises to supply all our needs! When you accept Jesus as your Lord and Savior and follow His commands, you have access to God and everything He is; peace, provision, protection and more. That means no matter what is happening in the world today, as you obey God’s Word, your needs will be met. No matter what is going on with the economy, gas prices, or housing market, God is still your Source; and if your Source is okay, then you are okay, too. Rest assured there is no lack in heaven.